July has arrived and, with it, the deep, dense heat of summer in New Orleans. Adults and animals know that the best way to cope is to find some shade and to stay as still as possible, but the kids don't seem to notice how hot it is. Summer sports programs are in full swing, and young people all over the city are out-of-doors. 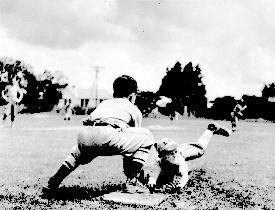 This month's images focus on the New Orleans Recreation Department (NORD), which has offered organized sports programs to the children of the Crescent City since its creation in 1947. NORD probably reached its peak in the 1950s when the excellence of its programs and facilities was recognized nationally. 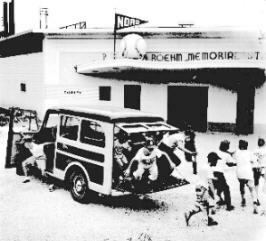 Currently, the administration of Mayor Marc Morial is attempting to halt the long period of decline which NORD fell into in the 1960s and is working to revitalize its programs for the children (and adults) of New Orleans. The Mohr Plumbing baseball team heads for NORD's Perry D. Roehm Statdium on Abundance Street, ca. August, 1949. This photograph by Life magazine photographer John Dominis accompanied a September 5, 1949 article congratulating New Orleans on its children's recreation program. Safe? We'll never know which of these NORD players was victorious, but both display excellent form and effort. This photo also appeared in the Life article cited above. 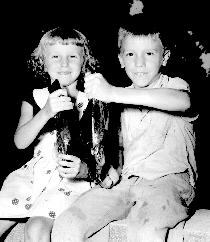 Two children proudly display their catches in the NORD kid fishing rodeo held in twice a year in City Park and once a year in Audubon Park. This photograph by Arthur W. Tong dates from 1954. Another Tong photo, ca. 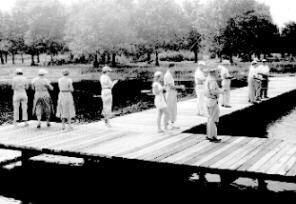 1955, shows the NORD Casting Pier in City Park where fishing classes for adults and children were held. Until the 1960s, NORD programs were segregated and programs, and facilities for white children far outnumbered those for African-American youngsters. 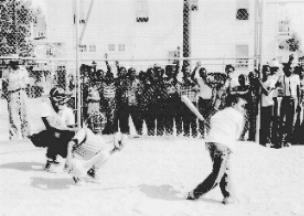 Here, children in the segregated program play baseball at George Washington Carver Playground, ca. 1954. Finally, an image to remind us just how hot it can get in July. 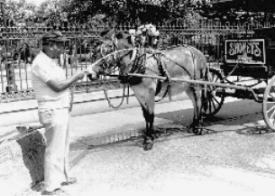 A French Quarter carriage driver sprinkles his mule in front of Jackson Square. We don't know the date, but it could be any summer in New Orleans.